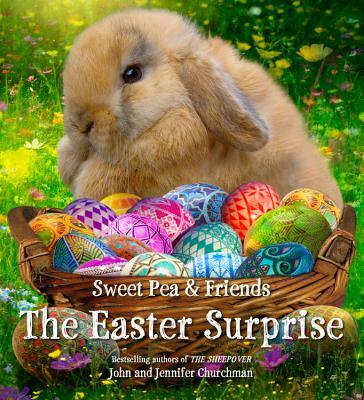 The fifth book by the authors of the media sensation and instant New York Times bestseller The SheepOver, featuring a curious bunny and her baby farm animal friends solving an Easter mystery together. Fern the bunny wakes up one morning to a surprise: the squirrels have discovered a beautifully decorated egg in their tree! And it's not just the squirrels--Mo the kitten, the goslings, the puppies, and even the lambs have all found special eggs hidden around the farm. As the baby animals follow clues from one egg to the next, Fern thinks she sees two soft, pointy ears peeking out above the grass. Then she notices a fluffy tail disappearing behind the barn. Then she spots long whiskers twitching among the flowers! Someone is watching, and the animal friends will have to solve their Easter mystery together to find out who. With vividly evocative photo illustrations, John and Jennifer Churchman bring to life a delightful story based on real animals and events on their Vermont farm. John Churchman is a photographer, artist, and farmer. Jennifer Churchman is a multimedia artist and writer. John and Jennifer combine their talents to give voice to the stories of all the animals who surround them and add boundless enjoyment to their lives. They have made their home on a small farm in the beautiful countryside of Essex, Vermont, with their daughter Gabrielle. They are also the authors of Brave Little Finn, A Farm for Maisie, and the New York Times bestseller The SheepOver. "Ornately illustrated...joyful photo illustrations offer a dreamlike, pastoral world that readers will be eager to revisit."